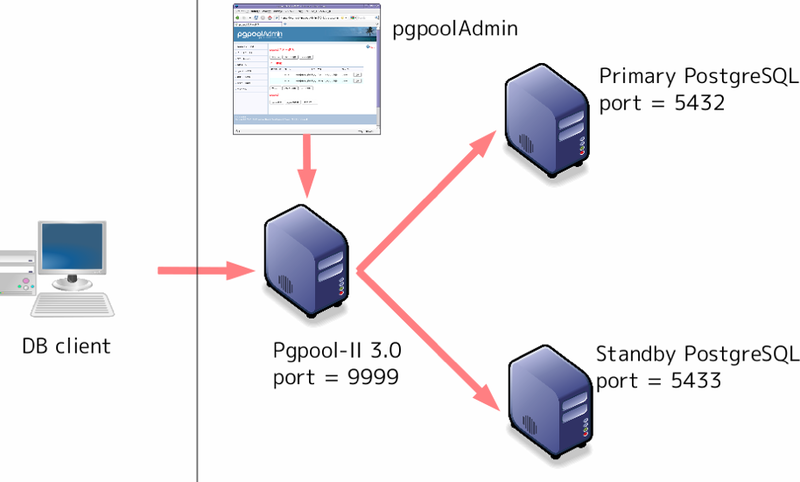 PostgreSQL Streaming replication with pgpool-II Part1 | URimagination, Inc. In this multi part tutorial, I will show how to create a simplified streaming replication setting using pgpool-II step by step. What you need is just a Linux box. Onto the box I install two PostgreSQL instances, pgpool-II and pgpoolAdmin. Please note that in this figure port 5432 PostgreSQL is assigned to the primary server and port 5433 PostgreSQL is assigned to the standby server. This is just an initial setting and afterward you can interchange the role of each PostgreSQL by using online recovery. The easiest way is downloading Linux package from PostgreSQL official site. However usually Linux packages allow starting only 1 PostgreSQL instance. So you need to disable automatic starting at the system booting time and start PostgreSQL by hand using pg_ctl. Another way to install PostgreSQL is from the source code. This is surprisingly easy actually. Just unpack the tar ball and configure; make; make install. The lists of parameters below are not really relevant to Streaming replication but these make things easier. The “log_statement = ‘all'” might be removed for production environments. Add following to /home/postgres/standby/postgresql.conf because we want to run standby PostgreSQL at 5433 port. $ cp source/path pg_hba.conf" /home/postgres/data"